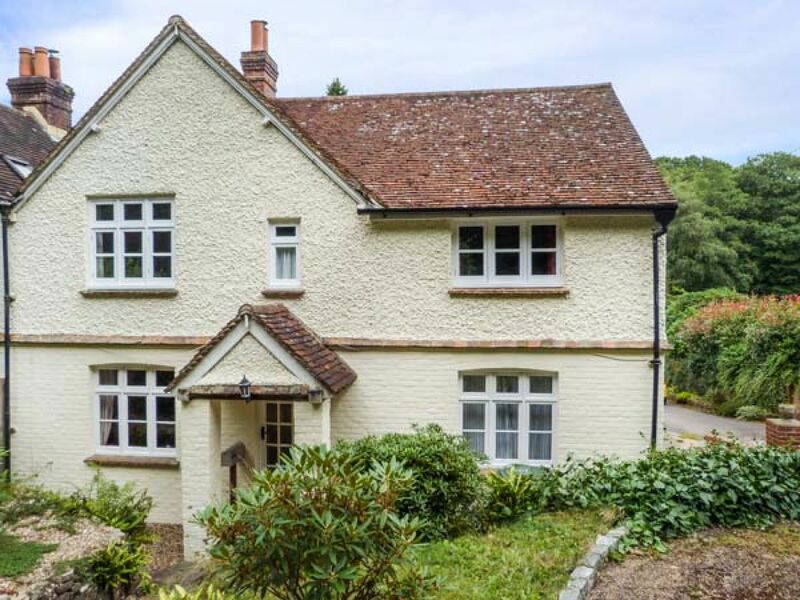 The holiday cottage of "Woodhill Cottage" can be found in Holmbury St Mary in Surrey. Woodhill Cottage can sleep 7 people with 4 bedrooms to sleep your holiday party. Woodhill Cottage has a bedroom makeup of: Four bedrooms: 1 x super king-size double with en-suite shower, basin and WC, 1 x double, 1 x twin, 1 x single. Bathroom with bath, shower over, basin and WC. Kitchen with dining area. Utility with WC. Sitting room. Snug (seats 4) with open fire. 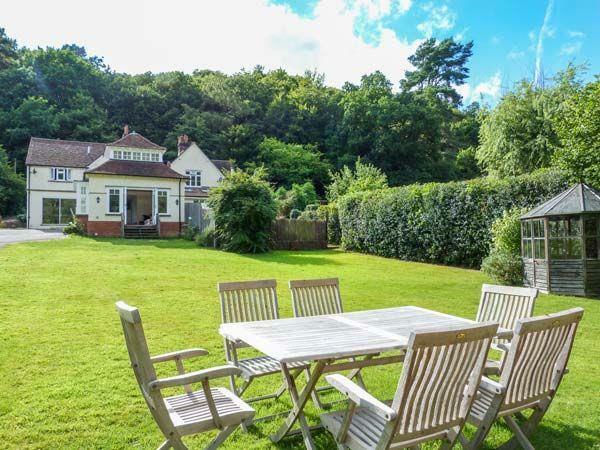 Woodhill Cottage is a good size for a family holiday. These are the reviews for Woodhill Cottage. There are 10 reviews. I don’t mind old or worn. A new chair can sit just as comfortably as an old chair, but when it comes to hygiene, only one way will do. The house needs a decent spring clean and the contents needs to be reviewed. Many of the dining room chairs were very rickety and could break at any moment. Other specific issues: - Main bathroom’s bath had soap scum ring all around the bath with 3 short black curly hair in it. - The two yellow cups in the main bathroom was covered in toothpaste as well as the sink. - The taps in both bathroom sinks had toothpaste splatter. - In the kitchen behind the breadtin next to the Aga, was a piece of food, looked like a small tomato that was shrivelling up. - Whomever unpacked the dishwasher last must have had greasy/oily hands, as the clean plates in the cupboard had greasy fingerprints all over them. - The en-suite bathroom window’s curtain is covered in black mold. - The table covering in the dining room had a streak of what looked like egg yolk running down the side of it. - Many of the dishes in the top right hand drawer next to the electric cooktop, has cracks in them (the red one, one of the blue spotty ones and many other small ones.) We did not use these, in case they broke. - We could not get any of the radiators upstairs to turn on, no matter how high we turned the heat. - Neither of the towel bars in the bathrooms ever switched on. - We were not cold upstairs as thankfully the floorboards had so many gaps the heat from down stairs made its way up. - The fridge is dirty with bits of food remains sprinkled throughout. - The master bedroom’s bed lost one of its slats when my husband sat down to tie his shoes. - The bed in one of the kids’ rooms (pink room with only one bed) also dropped a slat. We got there early and the housekeeper was very kind to allow us in as she was finishing the kitchen floor. She made us a cup of tea and it certainly was much appreciated. We would love to stay at this cottage again. Great location! It is spacious and the woods out back a real treat for the kids, but alas it needs some major cleaning and a good overall in its contents. Not sure if all Sykes’ cottages are in this state. Rented twice from Classic Cottages before and their cottages were spotless (so it can be done). If you're looking for other cottages around Woodhill Cottage, we've got some cottages below which may take your liking. There are 17 cottages within 10 miles of Woodhill Cottage - and they have reviews too.